Judith came over again and I am LOVING these frequent visits. She was here yesterday and will return next Saturday. Yipee. I haven't had this much fun all winter. After she left last week, I used some of the thickened dye to set up some silk screens for deconstructing. 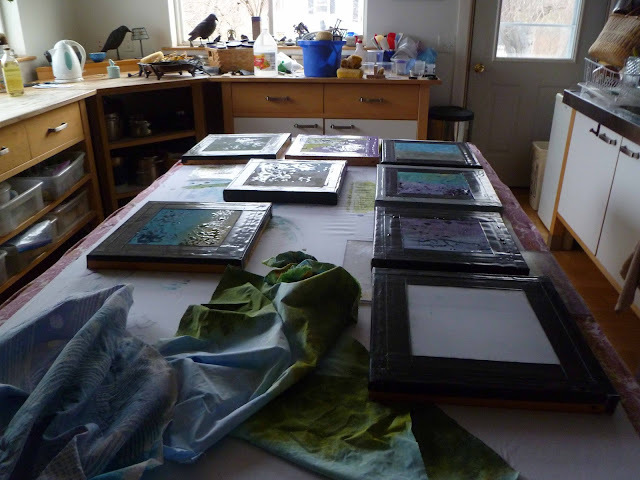 I broke them down with print paste on pre-treated fabric yesterday while Judith batiked her pieces at the other end of the table. I am continuing on the landscape series so please keep that in mind as I show you what I am doing to create workable pieces/parts of a landscape. These are the screen being set up. This one is one the line waiting to dry. I think I have mentioned why I dry all of the pieces I dye with thickened print paste before washing them out. 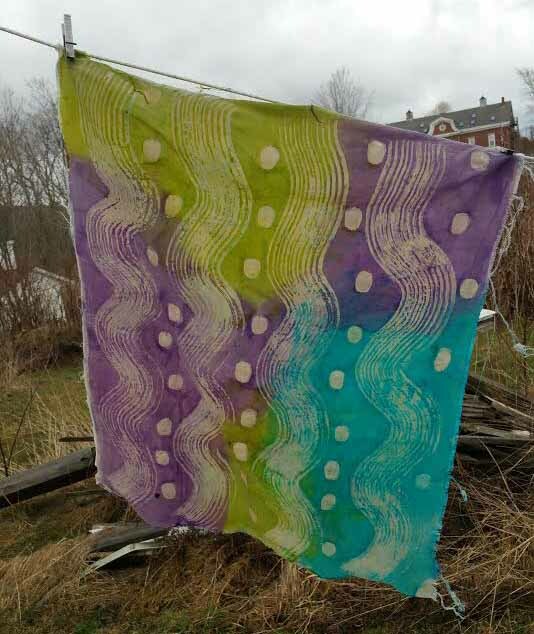 Although this was hanging on the line I oriented the photo so the horizontal nature of the pieces are easier to see. Obviously I miss the boat on the top most print - sheesh! This is one of two charcoal drawing I photographed, thresholded and sent to Lyric Kinard for making me a thermofax. I will use these in the landscapes as well. I love your printed fabric. I was wondering if you ever try to set up very similar screens to get a larger number of closely related pieces of fabric? I seem to find that I can only get a couple of prints out of each screen before some areas of the print are white (no more dye). The idea of setting up similar screens just occurred to me as I was looking at your photos. At least 3 of these screens were set up the same but each screen does three print. When the screen starts to peter out of you, use colored print paste instead of clear. 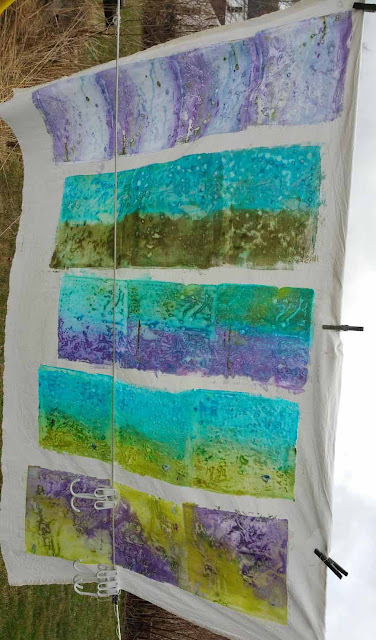 On the turquoise/green and turquoise/purple, I used colored print paste. What a beautiful prints! It's a long tima ago that I did this. Wait til you see what happens to them next!! I have not used this technique yet. Congratulations Beth, you've done some great things! Just wait a few more posts and you will see big changes in these pieces. I really want to try deconstructed screen printing! There is a real learning curve. It has taken me years to perfect it and these are NOT finished yet. Wait for upcoming posts. Wow. These are amazing. I can't wait to see what you do with them.